Saturday, I went to Stirling. Later in the evening, the Stirling Branch comrades had a curry night, to raise cash for the branch. We ended up with a shade under a hundred quid – which was by no means bad. The same night, there was a “supporters of the union” fundraiser – which raised around £300,000. 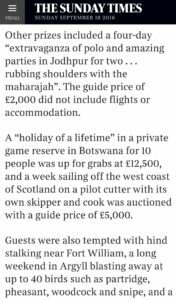 It was attended largely by the filthy rich, and reported in the Sunday Times. It’s worth noting that Better Together, from 2012 to 2013, didn’t have much in the way of regular high-value donors. There were two major reasons. Firstly, the splendid piece of journalism by Michael Gray on Vitol’s £500,000 – high-value donors sought to avoid investigation. Businesses risked alienating a significant proportion of their own customers. 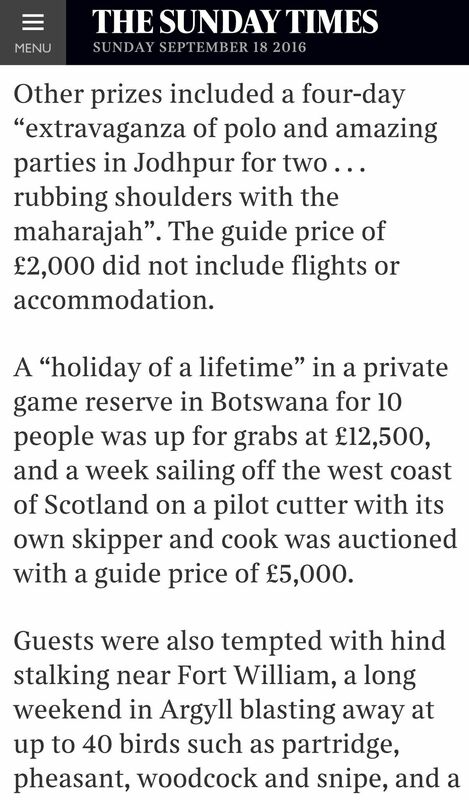 For example, Barrhead Travel and a backlash against the Confederation of British Industry. Also, many big-cheque unionists assumed the vote was “in the bag” until far too late. Wealthy philanthropists, would have calculated that a high-value donation to a campaign who’s reason for existing was the status quo and that was near certain to win, might not have been a good legacy for their money. The pro-independence camp is going to need a fortune the next time, in order not to be outgunned. The anti-independence camp are going to be much better organised and resourced this time round. Specifically, the unionist establishment know how much of a threat Yes can be. This time round, they’ll have it – and with cash swilling around to hire paid organisers, phone banks, highly detailed polling to distil the message, millions of leaflets and large-scale interventions. The last referendum’s tale was the disempowered finding their voice, projecting it with cheap fold-down tables, self-made leaflets, newspapers, hired halls, invited speakers and reaching out across Scotland – covering a variety of pro-independence arguments. The internet was the glue, quickly transforming the isolated into the connected. We found an untapped talent for activism – and achieved miracles on scotch-tape and lucky gazebos. Few were flush with money – outside of the occasional large crowdfund. Outside the office, getting wired up for a great big canvass. 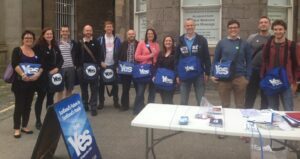 The Yes Edinburgh North and Leith campaign transformed with a modest crowdfunded cash injection, and regular monies from Free Space – selling loads of self-made Yes material (shout outs to graphics guru Stewart Bremner, and many others). First thing, we hired an office. Somewhere to keep the gazebos, piles and piles of paper leaflets and posters, canvass routes, broadband and desks for data entry, envelope and bag stuffing. It was a place of work, but had coffee and a water-cooler to rejuvenate knackered activists and served as a gang hut after-hours. Having an office transformed the operation overnight. No more did we have to fill up garages from miles away – a single point of contact made the organisation much simpler. Additionally, any future local Yes campaign should support paid organisers. It’s encouraging that two of the SNP deputy leader candidates (Tommy Sheppard and Alyn Smith) agree. This is an excellent idea, and we should raise the money to replicate it. They are the best thing to ensure activists are kept fresh, connected and motivated – and another single point of contact for the committed to keep working as they are able. Organising is the trade union movement’s bread and butter, it will not be difficult to find good staff to work full-time for the campaign. The unionists are building their war-chest. Therefore, we need to raise money – right now! – for the starting gun of the next referendum campaign, and have local and national battle plans ready.